Yesterday just under two thousand MicroView boards shipped without a bootloader, two of them were mine. Along with pretty much everyone else I’ve been seriously impressed with the response by Geek Ammo—the company behind the MicroView—and by SparkFun—who are manufacturing it—to the problem. A lot of Kickstarter projects would give you some instructions on how to flash the bootloader onto the board, and you would consider yourself lucky if the instructions were good enough to get the job done. Here the companies involved are going well beyond that. Everyone makes mistakes, but it’s how you handle them that makes the difference, and both companies are handling this problem with honesty and total transparency. You can’t ask for more than that. Their response is especially impressive considering that it’s turned out to be fairly easy to fix things yourself. While my initial impression yesterday was that the MicroView wasn’t going to come apart, or at least not in a way that would let you put it back together again, it turned out to be fairly easy to crack the case of the board without breaking it, and if you can get it apart you should be able to upload a bootloader. The MicroView is actually fairly easy to open. You’ll need to insert a thin metal tool between the edge of the glass top and the plastic surround—I used a metal spudger but a razor blade or a very thin precision screw driver would probably do—and carefully lever the glass upwards. After removing the glass you’ll see the OLED display, you’ll similarly need to pry this upwards. Here I used a plastic opening tool, as I figured something non-conductive was needed, but again anything thin enough to hook behind the display will do. Be careful however as the display is attached to the PCB using a ribbon cable, and prying it too far foward might dislodge, or even break, this cable. 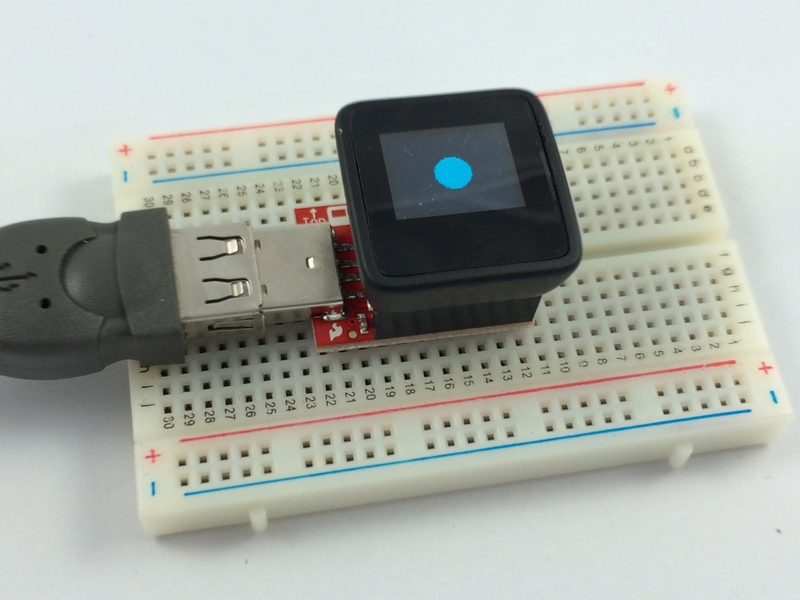 To upload the bootloader to the MicroView you’ll need an AVR Programmer. Don’t worry if you don’t have one of these, you can easily use an Arduino board to build one. 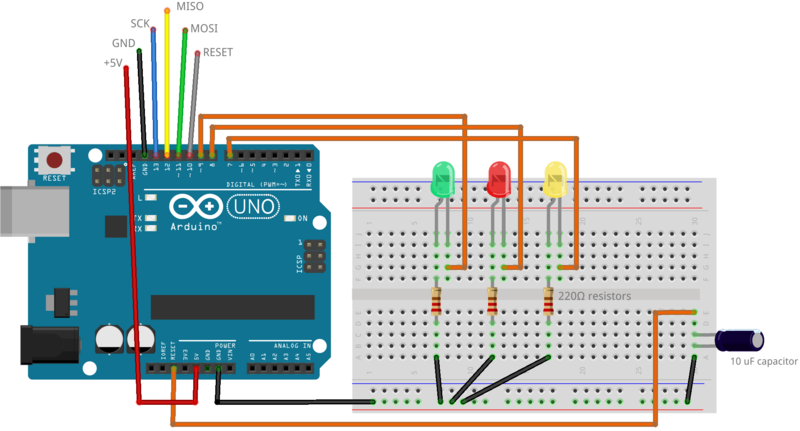 Go ahead and wire your Arduino board as shown in the diagram above. 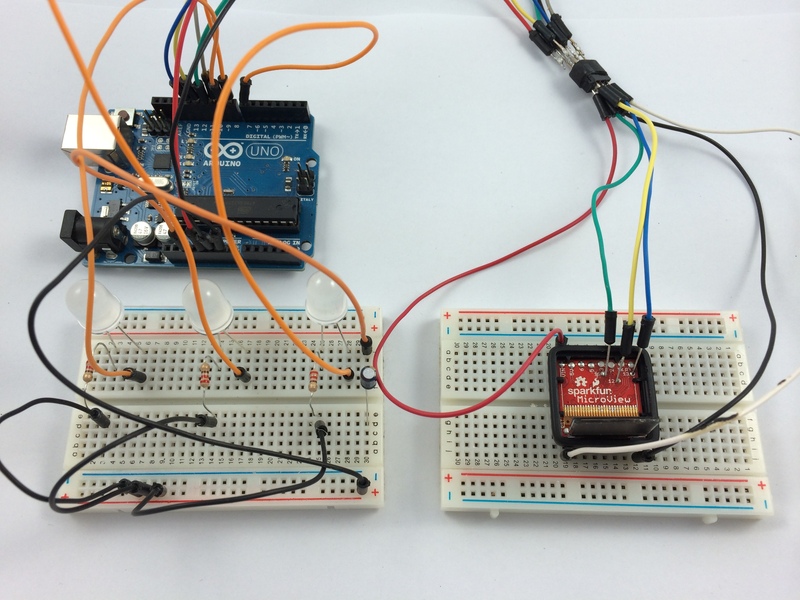 The 10 uF capacitor inline between the reset and ground pins is needed when using an Arduino Uno or Leonardo, however do not add this until after you upload the ArduinoISP sketch to the board—you’ll find the sketch in the Examples menu of the Arduino IDE—as with this in place sketch upload won’t work correctly. 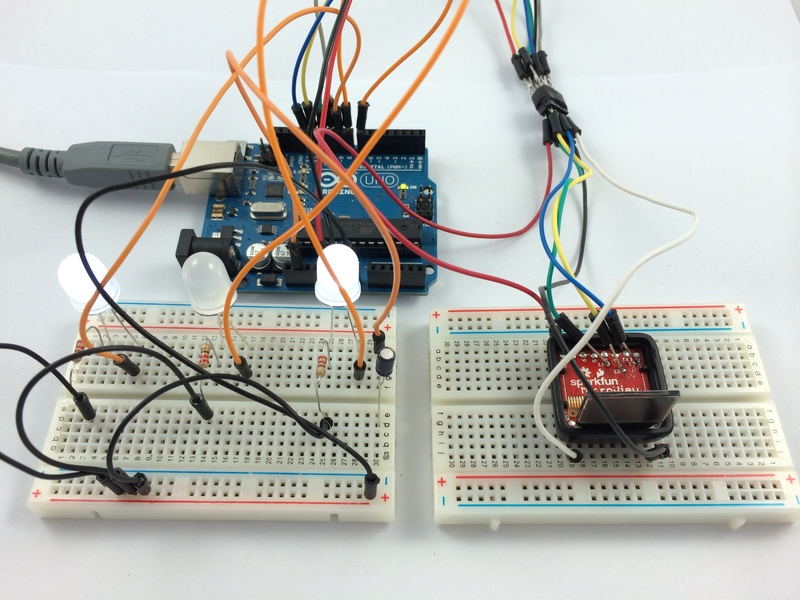 After uploading the sketch, and wiring in the capacitor, you should see that the left-most LED which is green in the above diagram, and connected to 9 of the Arduino, is softly pulsing—this is the heartbeat LED telling you that the programmer is running. The other two LEDs are for when the programmer is active. The middle LED, which is red in the diagram and attached to pin 8 of the Arduino, lights up when something goes wrong—hopefully we shouldn’t see that at all—while the right-most LED connected to pin 7 of the Arduino will light up when the programmer is active and talking to the “slave” board which we’re programming. Because of its small size the MicroView doesn’t have a standard ICSP header connecter. However wiring the programmer to the MicroView isn’t too difficult. Three of the wires can be directly connected to the external pins of the MicroView, so it’s only the MOSI, MISO and SCK that need to be connected to those small internal vias. I found that it was fairly easy to load a little solder onto the vias, and then by heating the end of the connecting wires while touching them to the blob of solder on the via, they could be tacked lightly into place. You don’t want to use too much solder here as, once the bootloader has been loaded onto the board, we’ll be removing the wires and resealing the case. Go ahead and plug everything together. Once the assembled and plugged in the heartbeat LED on the programmer should start pulsing and the MicroView should boot as normal into the pre-loaded demo sketch. We’re ready to go. Sparkfun has made a custom bootloader hex file available—go ahead and download it—this is what we’re going to load onto the MicroView. 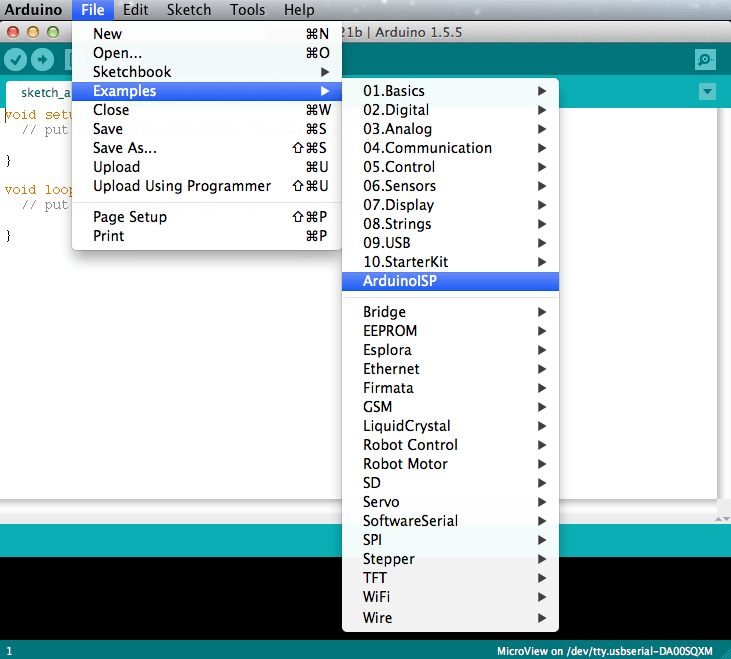 Then you have to locate your copy of avrdude—you’ll find it inside your Arduino IDE in the hardware/tools/var/bin directory, although on OS X this is actually buried inside the Arduino application bundle. substituting the name of your serial port, mine was /dev/tty.usbmodem1411, and the path to the MicroView’s bootloader—mine had ended up in my Downloads folder. As soon as you initiate the upload the screen of the MicroView will go blank, and while uploading to the right-most LED should light up. If the middle LED lights up, you’ve got a problem—take a look at the output from avrdude, it’s usually fairly self-explanatory, and try again (check that you’ve got all your path names and serial port names correct when invoking the command). However if everything goes well, the right-most LED will go out and the MicroView will reboot and start running the demo sketch again. Congratulations! You should now have a working MicroView which will allow you to upload code. We can test whether we have a working MicroView without closing the case back up. Go ahead and put detach the MicroView from the programmer—you can leave the three jumpered wires connected to the internal vias—and attach it to its USB Programmer. 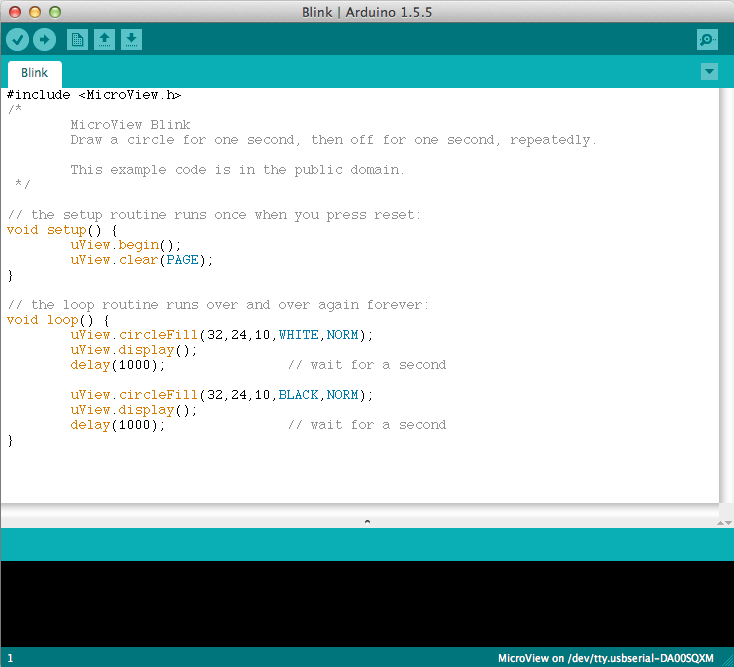 Then in the Arduino IDE and open up the MicroView Blink sketch—this sketch will draw a circle for one second, then off for one second, repeatedly—you can find it in the Examples→MicroView→LearningKit menu. You should now be able to follow Geek Ammo’s normal getting started instructions and upload the sketch to the MicroView. If all goes well you should see the promised circle blinking on and off on the OLED screen. Now you know everything is working, you can go ahead and un-tack those three jumper wires using your soldering iron. Just a second or so of heat, and a brief tug, should pull them off the board so long as you didn’t use too much solder. Once that’s done gently fold the screen back into the case—you should be able to use your fingertip. The screen should just pop back into place, and once it’s back the glass top of the MicroView should likewise just snap back into the case. However before doing that you should carefully wipe the glass down with a cleaning cloth as dust specks underneath the glass will be very obvious against the OLED screen, and probably pretty irritating. That’s it, we’re done, and you now have a fully working MicroView board. Possibly with a couple of scratches, but more or less intact. Congratulations!